This is a storyboard for the video project with Simon Jensen and Nathier Fernandez. The surrounding background starts from mundane indoor environment and zooms in to two different objects. Object 1, is something that melts inside a microwave or an oven; Object 2 is a land with mini figures inside a water container. 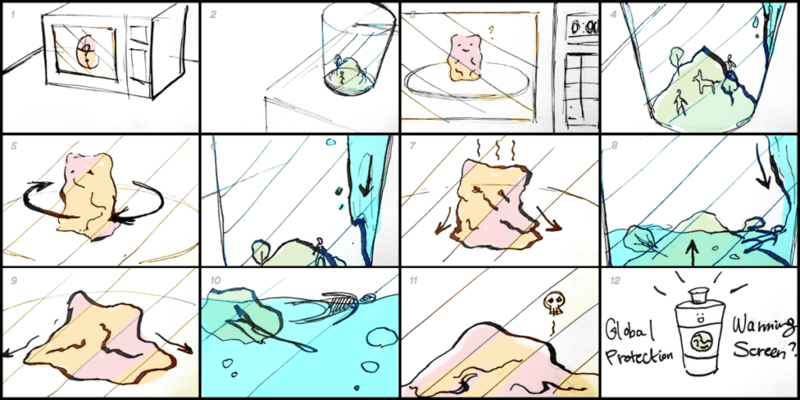 As the Object 1 starts melting, Object 2 is drowned by falling water. After both of the objects are destroyed, the invented product comes out and ends the video.